Torrential rains, rapidly melting of snow and glacial lake outburst further aggravated the floods situation across Pakistan. The floods have affected over 3,439 villages in over 23 Districts across Pakistan with 191 have died, 159 people have been injured and over 1,336,539 people have been affected. In Punjab, the districts of Rajanpur, Layyah, DG Khan, Rahim Yaar Khan and Muzaffargarh inundated by floodwater, According to the details more than 500 villages in Muzaffargarh, Layyah, KehrorLallUssain and KotMithan were inundated. Embankments were collapsed in Dera Ghazi Khan while the authorities had to opened spill ways of Tarbela Dam. Crops grown on thousands of acres of land along at least 256 kilometres (kms) of the river was also destroyed. The authorities had to shut down more than 200 canals due to flood in Head Taunsa. These canals include Muzaffargarh Canal, Dera Ghazi Khan Canal and TP Link. According to reports from PDMA Baluchistan, heavy rainfall and windstorms damaged 106 houses in Zhob, DeraBugti and Kohlu Districts. There are also reports of flooding in Barkhan, Harnai, Musakhel and KillaSaifullah Districts but so far no information of damages have been received. Flood water receded in a months from affected areas and which highlighted leaving crops destroyed, houses damaged, water contaminated and stagnant water posing serious threats to public health issues to affected population. But right now the affectees has somehow recovered but still there are unmet needs particularly shelters and WASH sectors. The affected couldn’t really receive the compensation as government provided the portion to district government which couldn’t reached to the affected households. The project initially was planned to be implemented in 10 districts through five diocesan units. Details of target areas per diocese are as under. Quetta Diocese: District Khuzdar and Sobatpur. Multan Diocese : District D.G Khan and Layyah. No incidents reported from flood affected areas. However, areas in the Province of Baluchistan remainedhighly risky and volatile. Caritas Pakistan has conducted a meeting with Provincial Disaster Management Authorities (PDMA)and security agenciesto determine appropriate security status. Tense in Baluchistan Province, district Sobatpur and Khusdar: varied security risks; may limit access to target areas at times. Normal in all other flood affected districts: no significant security risks that may affect the response. Shelter/NFIs:To provide adequate living conditions to 300 flood affected households and to prepare 1,500 households for the winter season. Capacity building:To build the capacity of affected communities in DRR, preparedness and protection issues in emergencies. Result 1.1 1200 households have access to sufficient food in flood affected areas by first quarter of the project. Result 1.2 1000 PLW have an increased knowledge on nutrition needs of mother and child in emergencies. Progress Achieved: 55 flood affected families have received food packages and women of the selected families participated in awareness raising sessions onnutrition needs of children and pregnant and lactating women. Caritas Pakistan Multan distributed food package to 55 families in district Layyah, Diocesan Executive Secretary Mr. Samuel clement also participated in the distribution. Distribution was held on September, 12 2015. The number of beneficiaries had to be revised because of underfunding of the appeal. Prior to the distribution of the relief packages, vulnerable families (beneficiaries) affected by floods were identified and a list of these families was prepared. In the second step “Distribution Coupons’ were handed over to these already listed families a day before the distribution. Beneficiaries Name/parents name, additionally CNIC number were mentioned on coupons that were signed and stamped by Caritas Pakistan officials. At the day/time of distribution, coupons were checked to ensure that it contain the required information also ensuring that person receiving the relief package was the same person who was identified/selected at the time of selection of beneficiaries. In case beneficiary doesn’t have the CNIC, he/she was verified by the village head/parish priest/catchiest and community development group (CDG)etc. And then his/her package was handed over. Result 2.5 500 community members/masons have appropriate knowledge/skills and are enabled to build resilient infrastructure techniques. 305 flood affected households have received hygiene kits, and same numbers of women have participated in awareness sessions on hygiene promotions. 15 flood affected households receive support to repair/install hand pumps. Due to stagnant water and unhygienic practices, hygiene promotion was the top priority of the program. Despite underfunding of the appeal initial targets have been reached. Hygiene kits were distributed along with food items and the same methodology was used during the distribution of hygiene kits. Distribution of hygiene kits to 55 families was held in district Layyah on September 12, 2015. Hygiene kits were distributed to 250 families in district Mianwali by Islamabad-Rawalpindi diocese. Result 3.3 500 community members/masons have appropriate knowledge/skills and are enabled to build resilient houses. 50 households have improved their living conditions through the receipt of NFIs. As the household items were washed away by floods, and there was dire need learned during the assessment to provide them household items in the shape of Kitchen Sets and Bedding material. Caritas Pakistan adopted the same methodology as described in the distribution of food packages. As observed,the provided household items really helped the affected families to restore their lives. Moreover, Caritas Pakistan paid particular attention to the quality of the items provided in order to make sure that they can be used for a long time. Caritas Pakistan has provided bedding material to 100 families. Families were selected through the same criteria used for distribution of food packages. Result 4.1 Health care services are available and accessible to 3,500 vulnerable individuals. 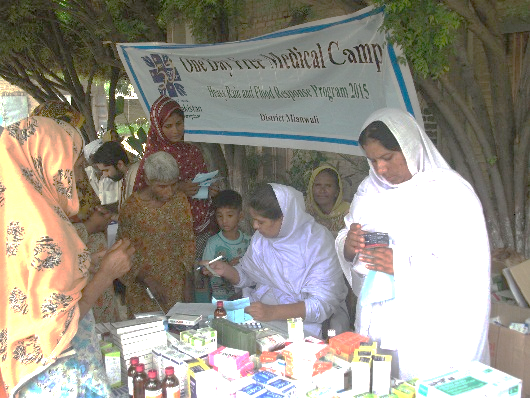 1784 individuals have received medical services in 11 medical camps organized in flooded affected areas. Caritas Pakistan provided health services at their door stepswith the purpose to improve the health condition of affected families. Free of cost medicines were provided to affected individuals, medicine lists developed by professional doctor of Caritas Pakistan in consultation with district government health department facility located in relevant areas. The location of mobile medical camps was finalized in consultation with target communities. Caritas Pakistan organized 11 mobile medical camps in flood affected areas and 1784 individuals received immediate and essential quality health services. Five medical camps were organized by Caritas Pakistan Islamabad-Rawalpindi diocese flood hit areas of district Mianwali.Six medical camps were organized by Caritas Pakistan Lahore diocese in flood hit areas of district Kasur. Result 5.5. 1000 individuals are enabled to preserve seed/fodder for a longer time through improved practices. 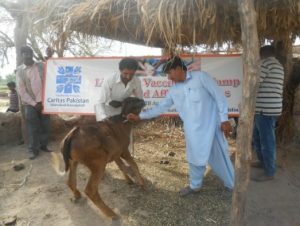 1500 animal were vaccinated by Caritas Pakistan Lahore diocese in district Sialkot and Narowal in collaboration with district livestock department. 2 trainings on livestock Management and 2 trainings on food preservation were organized by Caritas Pakistan Lahore diocese in district Narowal, 87& 71 participants respectively attended the trainings. Due to limited funded appeal this sector was not initiated. 85 community members participated in session on DRR and flood preparedness in 2 training sessions. 2 sessions on DRR & flood preparedness were organized by Caritas Pakistan Lahore diocese in district Sialkot, 85 participant. First session was held in Hanjli on September 28, 2015 attended by 45 and second session was held in Saidpur Hanjli attended by 40 community members. The appeal was underfunded and therefore all targets weresignificantly reduced. Capacity building / training 1,500 planned, 85 reached. BENEFICIARY SELECTION AND INVOLVEMENT(Ref. Section 4.5 CI-MS). Implementation of this project isin five diocesan units, Caritas Pakistan has existing in the areas through different interventions. So, field staff is very well aware of the cultural norms and behaviour of the communities which will help to select the deserving households and smooth implementation of the program with maximum participation of the communities. Beneficiaries’ selection will be done keeping in consideration that most vulnerable and deserving households are benefited. During the identification of the beneficiaries an initial Community Development Group (CDG) will be formed in every village/settlement. In case there is no Disaster Management Committee (DMC) exist. This group will be oriented about the selection criteria of beneficiaries, CDG and field will mutually select the beneficiaries. But overall responsibilities lies on CDG, Caritas Pakistan staff will be to there to facilitate the process and avoid any pressure or bias selection. Women headed households: there are numbers of women head households in society and normally they don’t have access to facilities because of the culture limitation. But once there are affected by floods in creates more hurdle for them, most of time they have limited access to the accurate information of relief assistance and at the time of un-organized distributions organized by different philanthropists create a mess and only male can access. Therefore particular importance will be given to these households. Poor/low income households: low income and daily wages are already neglected member of society and during flood they lost everything and most important there is no livelihood opportunity so it become extremely hard for them to buy basic necessity of life i.e. food, health and shelter. Hence Caritas Pakistan will give them priority to be the beneficiaries of the interventions. Persons with disabilities: Generally Pakistan society is no supportive to the persons with disabilities in normally days people make fun of them. They are considered as useless members of society and most of the time ignored in routine life. But it comes to be affected by disaster, no family has priority to support or encourage person with disabilities. Knowing the reality Caritas Pakistan will prioritise households having person with disabilities and their needs will also be catered. For the distribution of fodder it will be ensured that small farmers/households don’t have access to fodder are selected. Fodder will be selected in consultation with relevant communities. Caritas Pakistan is in coordination with CIMOs based in Pakistan, for the purpose a meeting was held in Islamabad to discuss the developing situation of the floods and possible response plan of CIMOs in the country. Caritas Pakistan is sharing and communication with CIMOs based in Pakistan, consultation was also held with Caritas Germany and Trocaire to discuss flood response plan. A meeting was organized with Catholic Relief Services (CRS) to discussthe developing situation of floods in the country and the possible response strategy to meet the needs of the affected. Caritas Pakistan has also organized meeting with diocesan units affected by floods with purpose to review the situation on ground and planning to respond the flood emergency and new formats form tool kits were also shared with diocesan units. Caritas Pakistan has the capacities to plan, implement and monitor Emergency Appeals, in recent years one of the major disasters Caritas Pakistan responded to and managingEAs of more than a major scale €250,000 on regular basis. Earthquake 2005, Cyclone Yameen 2007, IDPs crisis 2009, Supper Floods 2010-2013, Drought Emergency 2014, TDPs crisis 2014. Through these interventions Caritas Pakistan has gain considerable experience of planning and implementation of emergency response programs. One of the major lessons learned is working in close coordination with government and other humanitarian agencies which Caritas Pakistan has adapted. Therefore Caritas Pakistan has developed considerable relation with government at district, provincial and national level. As the flood is regular feature and Caritas Pakistan have been managing same nature of project in recent years. Thereforeorganisations didn’t requested any additional operational support, such as ERST, STEP and Facilitating Partner. Human resources (Ref: Section 2.4 CI-MS). Existence staff members engaged for the implementation of the project, these staff members have the experience of managing activities for the flood and heavy rain affected in the past, but considering the working environment and the cultural issues, Caritas Pakistan hired/engaged local staff for better and prompt implementation of the activities. Caritas Pakistan national secretariat and diocesan units utilized theexisting facilities of warehouses, vehicles and generators as well that was used duration the implementation of the project. But Caritas Pakistan also charged fuel and maintenance to this project. Monitoring (Ref. Section 4.6 CI-MS). The Diocesan Executive Secretary regularly visited the target areas and monitored the activities At diocesan level, and feedback from the affectees about the interventions of Caritas Pakistan was taken on fortnightly basis; suggestions and recommendations were made on ground to filed team whereas all information were regularly also be shared with national secretariat. Caritas Pakistan National Secretariat has deployed human resources in Diocesan units; one preventative from National Secretariat was stationed in each diocesan unit to speed up the process and technical assistance, involvement in all process and monitoring of activities as well. At National Secretariat level, team comprising of National Disaster Management Coordinator, National Coordinator DRR& Response, Communication Officer, Coordinator WASH and Monitoring & Field officer under leadership of Executive Director Mr. Amjad Gulzar also conducted periodic monitoring visits to target areas and also participated in the activities of the project on monthly basis. Suggestions and recommendations were made to diocesan staff for better service delivery. As Caritas Pakistan consistently reported to District government prior and after the execution of activities, district Government also conducted monitoring visit on fortnightly basis. All concerns were discussed in coordination meetings that were held at district and provincial level. Community Development Groups (CDGs) monitored the activities on ground and also facilitated monitoring visit conducted by Caritas Pakistan or government agencies. At village level CDGs was the executing body/responsible to national Secretariat team that were also conducted meeting with CIMOs in county, local government officials and discuss the progress of Caritas Pakistan interventions.